Tanvi and Deep's rooftop ceremony was nothing short of spectacular. The color scheme was simple: the brightest and most vibrant yellow combined with the most pure and clean white. The stark contrast between the two main colors reminded our team of the true beauty of simplicity! We played with the design of this ceremony for nearly a year before deciding on this look (everything about this design was custom built and designed for Tanvi and Deep)- and we absolutely love the way it all came together. Braja Mandala's Photography truly does this design justice. Let your eyes feast on these magnificent images below- we're pretty sure the sunny colors and clear blue California sky will brighten your day! The ceremony design featured a large white canopy with six pillars in a hexagonal shape. The ceiling of the design was created using white chiffon draping and the center featured a floral ring lined with white hydrangea and dozens of strands of yellow and white floral garland. Proof of the sheer beauty of this design can be seen in this image below- sometimes what looks good for the guests of a ceremony looks quite different for the couple standing underneath it. Fortunately, the beautiful yellow and white garland that was draped around this ring of hydrangea looked just as spectacular from below! The chiffon-draped ceiling flowed beautifully in the wind (see what I mean in action in the video below provided by Avec Lumiere Productions). Floral garland takes quite large amount of time to create- and it truly is an art. The SYED team was blessed this summer with lots of opportunities to perfect our own process of creating it! This garland was created using different types of yellow roses and spray roses along with a few different white florals. These white tufted chairs added another touch of elegance to the overall look. 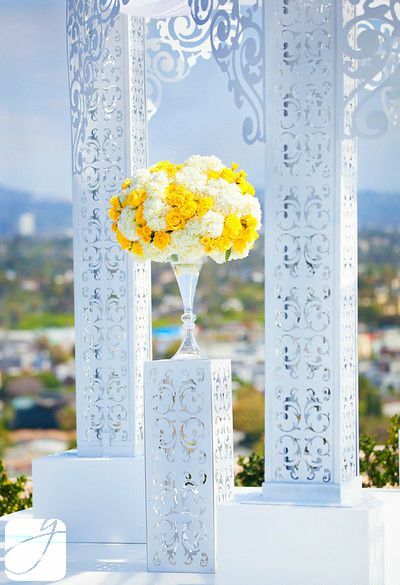 Perched atop two coordinating lucite columns were sparkling glass reflection vases with lush white and yellow floral pieces. The wonderfully clear day in Southern California was the perfect backdrop for this wedding! The use of a whimsical pattern on the design allowed for the bright and beautiful sky to shine through and make the entire canopy look as though it truly belonged in front of the beautiful skyline. Tanvi & Deep were a beautiful couple and we are honored to have been a part of their special day. Watch it all in action below! Much love to all of the amazing vendors that came together to make this beautiful work of art a real thing!